We have some new and exciting news to share with all of you! We recently added a wedding deals section to our website! Find wedding discounts on photographers, DJ’s, Florists and many more wedding vendors in your area! Are you from Orlando, FL? Get a free “Trash the Dress” session with The Wedding Traveller, when you book your wedding photography package with them. Are you from San Diego, CA? Get complimentary Hors d’oeuvres when you book Spectacular Catering and Events. How about a half price hair and make up trial in Chicago, IL for only $50? Normally $100! Looking at rose petals for your wedding? Flyboy Naturals Rose Petals is offering 20% off any rose petal package! They ship nationwide! Are you from Dallas, TX and in need of a Limousine Service? Get an hour free when you book with Uptown Limousine Service. Take advantage of these great deals! Check back often as this is a new feature and our vendors will be creating more wedding deals and wedding discounts for you! 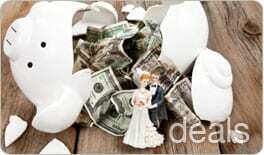 Click he to find wedding deals and wedding discounts in your area.